My family has found a wonderful way to relieve stress -- dancing! Just crank up the music, let it all go and sing and dance away. It's amazing how much better you feel after just a little spontaneous movement. Plus, if you add kids to the mix, smiles and laughter are all but guaranteed. Kids have the best moves! 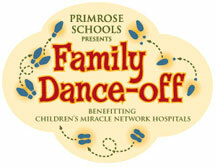 Primrose Schools is currently holding a Family Dance-off Contest that benefits Children's Miracle Network Hospitals. To enter the contest all you need to do is visit www.FamilyDanceoff.com and upload a 30 second video of your family boogying to the beat. Three winners will receive cash prizes and Primrose Schools will donate a total of $65,000 to Children’s Miracle Network Hospitals in the top three winning families’ hometowns. Last day to enter is March 19th. Visit the Family Dance-Off website for full details and official rules. Thanks to Primrose Schools and MomSelect, my family recently held our own little dance party. They sent us a party pack that contained an awesome CD, t-shirts, gift card, ideas, recipes and a FLIP Camcorder. We especially love the Kids Dance Party: The Party Cats CD. The CD includes many lively party songs, and we've listened to it numerous times already. Both kids love dancing along to the familiar "I Like to Move It" and have their own dizzying version of a "Cotton Eye Joe" dance. My husband and I relived some of our school days when we heard "U Can't Touch This," and we tried to explain baggy "Hammer" pants to our kids. This week, in anticipation of the upcoming St. Patrick's Day holiday, we've started practicing our Irish dancing. Here's a short clip of the kids dancing to The Chieftains version of "Cotton-Eyed Joe" from the album The Wide World Over: A 40 Year Celebration (they are wearing their Dance-off t-shirts and some flashy red accessories). Primrose Schools hopes the promotion will increase awareness about the need for exercise and a healthy lifestyle in preventing childhood obesity. Dancing together as a family is one fun way to add physical activity to your daily schedule. If you are interested in supporting your local Children’s Miracle Network Hospital, you can donate through the link provided on the Family Dance-off Website. "The Family Dance-off supports Children's Miracle Network Hospitals, a non-profit organization that raises funds for more than 170 children's hospitals, which collectively treat 17 million children annually for every illness and injury imaginable. The grand prize winner of the Family Dance-off receives a $5,000 cash prize and a $30,000 donation to their local Children’s Miracle Network Hospital."